Rocky Mountain Barrel Company, the used wine barrel distributor and wine cellar manufacturer based in Denver, CO has recently completed the full restoration and modification of one of the world's largest antique wine barrels, and has custom manufactured the barrel into a fully functional wine cave. The barrel used for the project is a 3750 gallon wine barrel that stands 8'6" tall and 9' wide, is over 110 years old, hand-crafted in Europe and then shipped to a US brewery in the early 1900s. This barrel was in use until the prohibition of alcohol in 1920, and has remained hidden until the discovery by the Rocky Mountain Barrel Company in 2011. 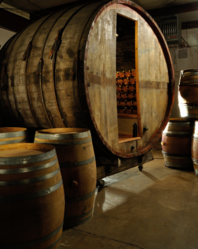 After seven months of restoration and modification, the wine barrel cellar is complete and will go on sale to the general public on June 1, 2012. Rocky Mountain Barrel Company is extremely excited to offer this one-of-a-kind opportunity to own a truly unique piece of wine-making history. There are no other wine cellars like this in the world! Rocky Mountain Barrel Company, the used wine barrel distributor and wine cellar manufacturer based in Denver, CO has recently completed the full restoration and modification of one of the world's largest antique wine barrels, and has custom manufactured the barrel into a fully functional wine cave. The barrel used for the project is a 3750 gallon wine barrel that stands 8'6" tall and 9' wide, is over 110 years old, hand-crafted in Europe and then shipped to a US brewery in the early 1900s. This barrel was in use until the prohibition of alcohol in 1920, and has remained hidden until the discovery by the Rocky Mountain Barrel Company in 2011. Aside from the extremely large size, this Wine Barrel is extremely old, yet the wood remains in pristine antique condition. Because of the size and condition of the wine barrel, and the restoration and customization efforts of the Rocky Mountain Barrel Company, this Wine Cellar is a truly unique product, and is the only one in the world. While discovering this unique wine barrel, Rocky Mountain Barrel Company have come upon several other large wine barrels that will be restored and customized to meet the needs of wine connoisseurs and collectors alike. Owner Skyler Weekes will travel to Italy, Spain or Argentina and transport the wine barrel back to the United States, and will then custom build a wine cellar into one of these large wine barrels for use in your home or business. If you’re interested in owning this piece of wine-making history, or you would like to place an order for the next wine barrel cellar created by Rocky Mountain Barrel Company, please contact principal Skyler Weekes to discuss your options. About Rocky Mountain Barrel Company: Rocky Mountain Barrel Company was founded in Denver, Colorado by Skyler Weeks, an executive wine sommelier and executive chef who was inspired to bring consumers the finest quality used oak wine barrels from North America. Today, Rocky Mountain Barrel Company has grown into one of the largest resellers of used wine barrels in the United States.